In case you need biscuit-baking inspiration, we’ve been digging in our library and archives for examples of biscuit recipes you might not have come across before. 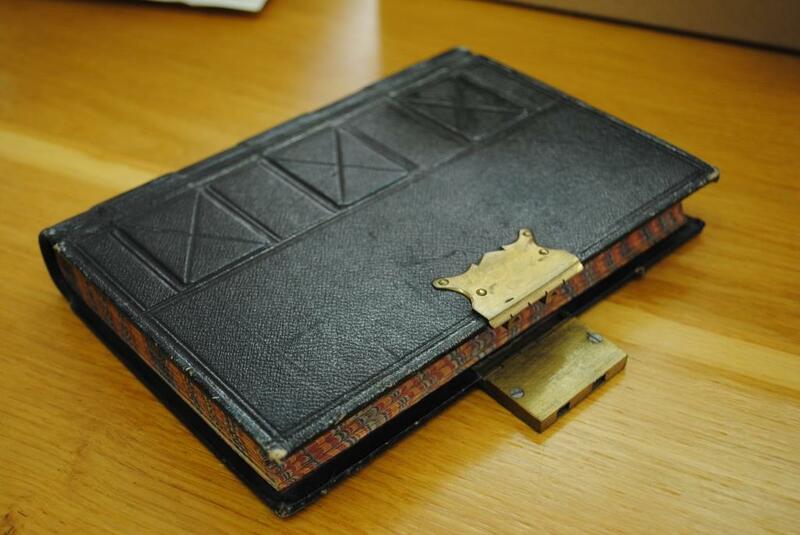 Our Librarian has managed to find several interesting recipes in the rare books collection, such as Lemon biscuits and Drop biscuits from ‘The London Art of Cookery’ by John Farley (1792) RESERVE 641.5 FAR; Ccommon biscuits, from The Frugal Housewife by Susannah Carter (1795) RESERVE 641.5 CAR; and Threadneedle Street biscuits and Aunt Charlotte’s biscuits in ‘Modern Cookery for Private Families’ by Eliza Acton (1875) RESERVE 641.5942 BUR. One of our volunteers also spent a morning in the reading room and found recipes in a handwritten recipe book with newspaper cuttings from the 1920s, a farm account book for a farm in Sutton Scotney, Hampshire, 1854-1865, which, as well as detailing quantities of crops sown and harvested, and account of livestock, was used as a copy book and recipe book, 1882- c.1913. 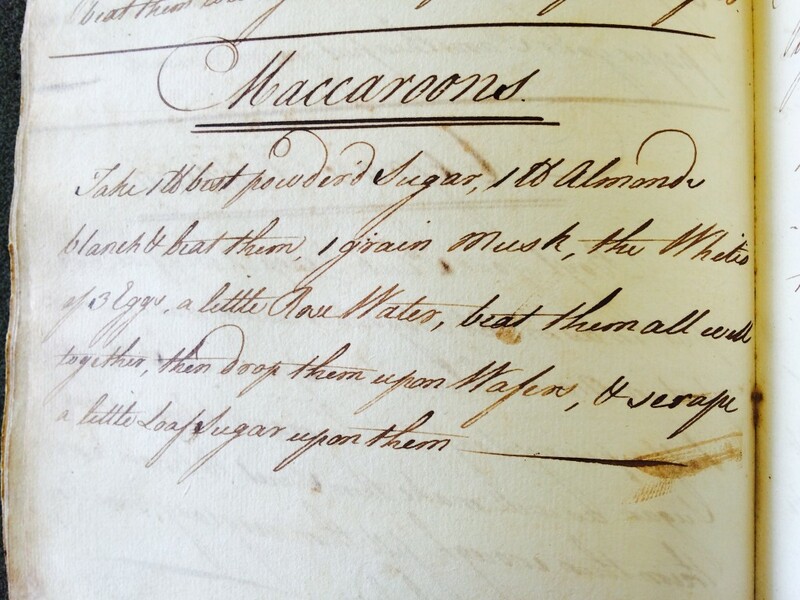 She even came across a 100+ year old macaroon recipe to rival Picnic’s! But the recipe which caught my attention was the Threadneedle Street Biscuits, simply because I was intrigued by the name. Threadneedle Street is the location in London of the Bank of England, but I haven’t managed to find out what the connection is! 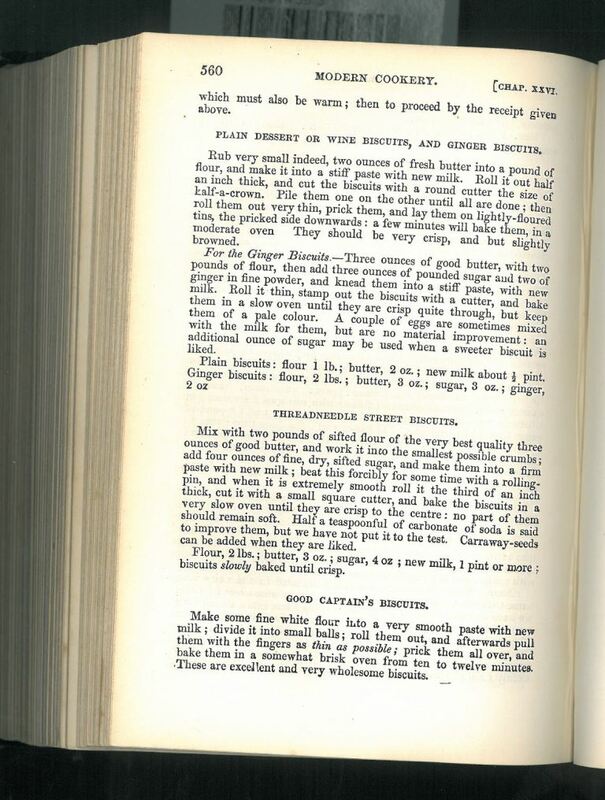 The recipe appears in ‘Modern Cookery for Private Families’ by Eliza Acton (1875), on a page with Plain dessert or Wine biscuits, Ginger biscuits and ‘Good Captain’s biscuits! Mix with two pounds of sifted flour of the very best quality, three ounces of good butter, and work it into the smallest possible crumbs; add four ounces of fine, dry, sifted sugar, and make them into a firm paste with new milk; beat this forcibly for some with a rolling pin and when it is extremely smooth roll it the third of an inch thick, cut it with a small square cutter, and bake the biscuits in a very slow oven until they are crisp in the centre: no part of them should remain soft. Half a teaspoonful of carbonate of soda is said to improve the, but we have not put it to the test. Carraway seeds can be added when they are liked. Give it a go and let us know what they’re like and don’t forget to bring your homemade biscuits to the Fete on Saturday and enter the Bake-off! For previous recipes, click here and if you’re interested in the other recipes mentioned above, come along to the Bake-off stand at the Fete to pick up a copy of our biscuit recipe compilation leaflet! 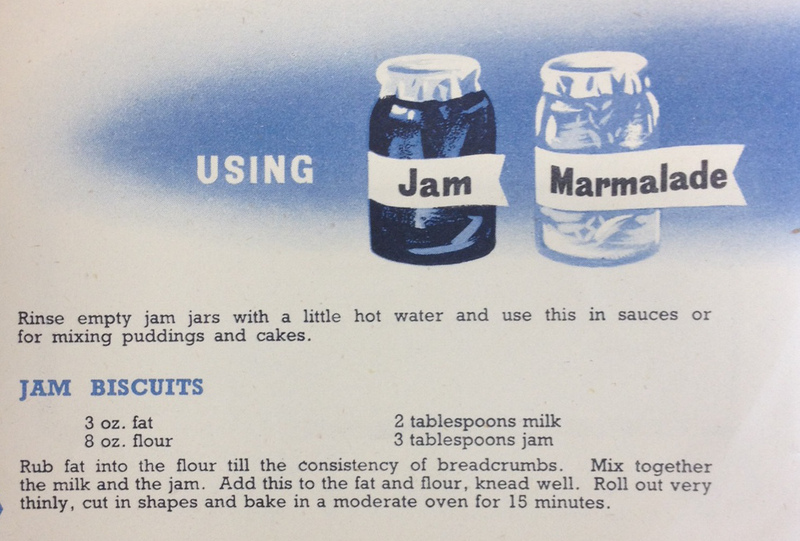 This week’s biscuit recipe comes from Ministry of Food pamphlets found in the MERL Library collections; two pamphlets have been used to give you a recipe with a twist (and a bit of a challenge!!). This particular twist is definitely for the more experimental among both biscuit enthusiasts and beginners, as the recipe not only gives a fairly conventional and simple biscuit recipe, but also instructs how to make the jam from scratch. The recipe itself is fairly straightforward, but a little more complicated than previous weeks. Both pamphlets are from the late 1940s post-war era. They thus contain, as you may find in any recipe books or pamphlets of the time, some rather misogynistic top tips for the ‘contemporary housewife’, which I’m sure you’ll be pleased to see have not been forgotten below! 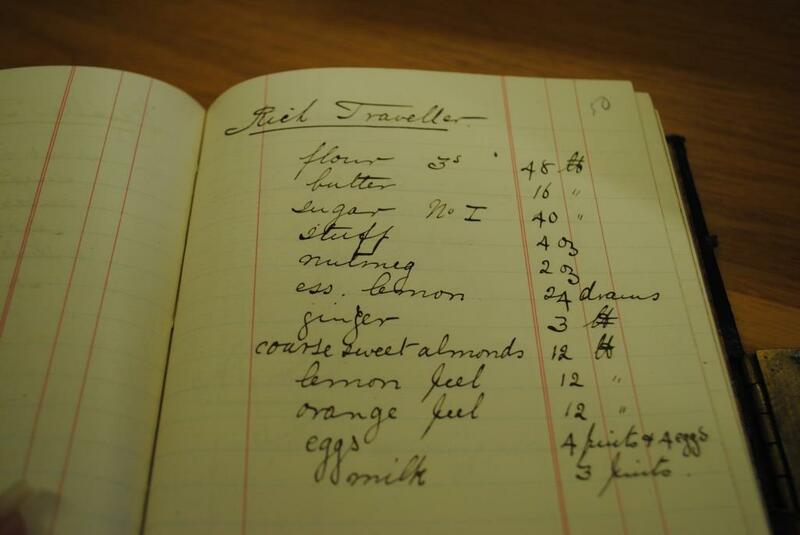 It is also interesting to note that the biscuit recipe was written with the intention of, as the title suggests, ‘Making the most of sugar’ when it was scarcely available due to rationing. The best way of stretching the sugar ration is by making full use of other sweetenings such as saccharin, honey, syrup or treacle, jam, marmalade, sweetened condensed milk and dried fruit. Rinse empty jam jars with a little hot water and use this in sauces or for mixing puddings and cakes. Rub fat into flour till the consistency of breadcrumbs. Mix together the milk and the jam. Add this to the fat and flour, knead well. Roll out very thinly, cut in shapes and bake in a moderate oven for 15 minutes. Housewives who have saved sugar to make home-made jam are advised to follow very carefully the instructions given below. Fruit should be fresh and firm-ripe. Over-ripe fruit should NOT be used. Before the sugar is added, the fruit should be cooked slowly until it is quite tender, with just sufficient water to prevent it burning. Stir occasionally to prevent sticking. SUGAR is stirred into the softened fruit until dissolved and the jam then boiled rapidly until setting point is reached. Do not have the pan too full or the jam will boil over at this stage. Stir occasionally to prevent sticking. Removing Scum. Do this only when boiling has finished. Constant skimming is wasteful and unnecessary. Testing for setting point. Begin to test after about 10 minutes of rapid boiling (after sugar has been added). Remove pan from heat during testing. To test: place a little jam on a cold plate; if setting point has been reached, the jam will wrinkle when pushed with a finger. Filling the Jars. To prevent fruit rising in the jars, the jam should be allowed to cool slightly in the pan. Put on wax disks while hot, and press down over the surface. Put the fruit in the pan and cook slowly until some juice has come out of the fruit. Add the sugar, stir until it is dissolved, and boil rapidly until setting point is reached. Please try out the recipes and don’t forget to enter the MERL Village Fete Biscuit Bake-Off on 31 May! by Alison Hilton, Marketing Officer and biscuit sampler. 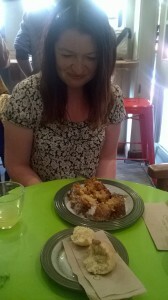 Fans of Picnic Café in Reading will share my excitement about this week’s recipe, which owner, Jon Amery has kindly agreed to share. Picnic is supplying the cake for the tea tent at the MERL Village Fete again this year, and Jon will be a judge on the Biscuit Bake-off panel. We mentioned these weekly biscuit recipes a little while ago to Jon, hinted at our preference for Picnic’s delicious macaroons and held our breath! Apparently it was a topic of some debate amongst Picnic staff as to whether the macaroon could be classed as a biscuit. Thankfully, it seems it can! Last week, Phillippa and I decided to prove our dedication, and visited the café for a working lunch, which obviously had to include the famous macaroon (and some apple cake!) … it’s a hard job, but someone has to do it! Mix together 440g of ground almond, 300g of caster sugar (we use an unrefined organic sugar from south America) and 4 egg whites until consistent in texture. Shape into golf ball sized balls and place on a baking tray ensuring a 1” gap between balls Push (don’t place as they will fall off!) a whole almond on top. Pop in a pre-heated oven for approximately 20 minutes on 180 C or until golden brown. Have a go and let us know how they turn out! If you’re brave enough to put your version in front of Jon, why not enter the Biscuit Bake-off at the Village Fete on May 31st?! At the recent launch of the Biscuit Bake-off competition, Andrew Palmer’s wife, Davina, very kindly presented MERL staff with a signed copy of her book ‘Kitchen Diplomacy: 30 years of Foreign Service Cooking’. I was amazed to discover, on reading the introduction, that Davina seems to have lived her whole life in diplomatic circles, during his career Andrew has been Ambassador in Cuba and Rome, and during their marriage they have lived in 8 different countries including Bolivia, Canada and France! Davina’s book, then, is a fascinating insight into Embassy life – and of course, food! I was pleased to find that amongst some very special, classic and exotic recipes, there were also recipes for brownies, chocolate biscuit cake, and the humble chocolate chip cookies, which is the one I’ve decided to share today! Put butter in a food processor with both sugars.Process, add the beaten egg, sifted flour and salt and process again. Turn into a bowl and add the chocolate. Drop little mounds of the mixture on to oiled baking sheets and bake for 12-15 mins until light golden. 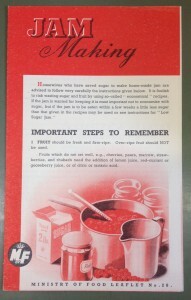 A perfect recipe for trying with children and entering into our Biscuit Bake-off at the MERL Village Fete on May 31st. Click here for previous recipes, and look out for a very special recipe next week! 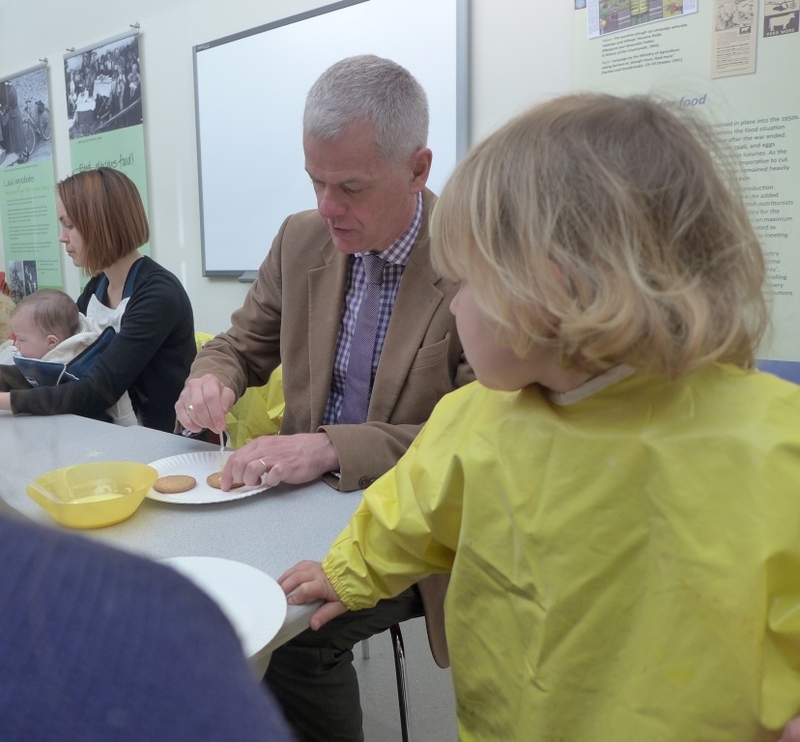 At the launch event, one Toddler was very proud to show us his biscuits, and with a little prompting from mum, he was able to tell us confidently that they were Anzac Biscuits. Although I was familiar with the term ‘Anzac’, I’d never heard of the biscuits, but a little research revealed that they were originally made to send to the ANZACs (Australian and New Zealand Army Corps) serving in Gallipoli. Apparently they were sent by wives to soldiers abroad because the ingredients did not spoil easily and the biscuits kept well during naval transportation. This, along with the general scarcity in wartime, is why there are no eggs in these biscuits. Anzac Day is celebrated on April 25th, and marks the anniversary of the landing in Gallipoli in 1915, a campaign which led to major casualties for Australian and New Zealand forces during the First World War. Heat oven to 180C/fan 160C/gas 4. Put the oats, coconut, flour and sugar in a bowl. Melt the butter in a small pan and stir in the golden syrup. Add the bicarbonate of soda to 2 tbsp boiling water, then stir into the golden syrup and butter mixture. Make a well in the middle of the dry ingredients and pour in the butter and golden syrup mixture. Stir gently to incorporate the dry ingredients. Put dessertspoonfuls of the mixture on to buttered baking sheets, about 2.5cm/1in apart to allow room for spreading. Bake in batches for 8-10 mins until golden. Transfer to a wire rack to cool. Give it a try and let us know how you get on! If you enjoy these biscuits, why not enter them into the Biscuit Bake-off at the MERL Village Fete on May 31st?! Welcome to our series of biscuit recipes to inspire you to take part in the Biscuit Bake-off at the MERL Village Fete on May 31st! Clearly these are quantites for industrial scale biscuit production, so you’ll need to scale down dramatically!! We have tried to reduce the quantities to a more domestic scale and convert the units to metric, but it’s tested our maths to the limit (even with the help of Google, and we gave up on calculating the ounces and drams scientifically!) We should warn you, we haven’t tested the recipe at home yet, so you may have to use your ! Why not give it a go and let us know how you get on – we’re going to try it out this weekend?! If you’d like to enter the Biscuit Bake-off, click here for details. And if you’d like to contribute a ‘guest biscuit recipe post’ to this blog, please let us know! MERL Village Fete: MERL Toddlers take the biscuit! This is the first of a series of posts from the Village Fete team on the run-up to this year’s event, by Alison Hilton, MERL Marketing Officer. Preparations for the 2014 MERL Village Fete are well underway and it’s exciting to be able to start sharing some of the new features of the event, which will focus on food this year! 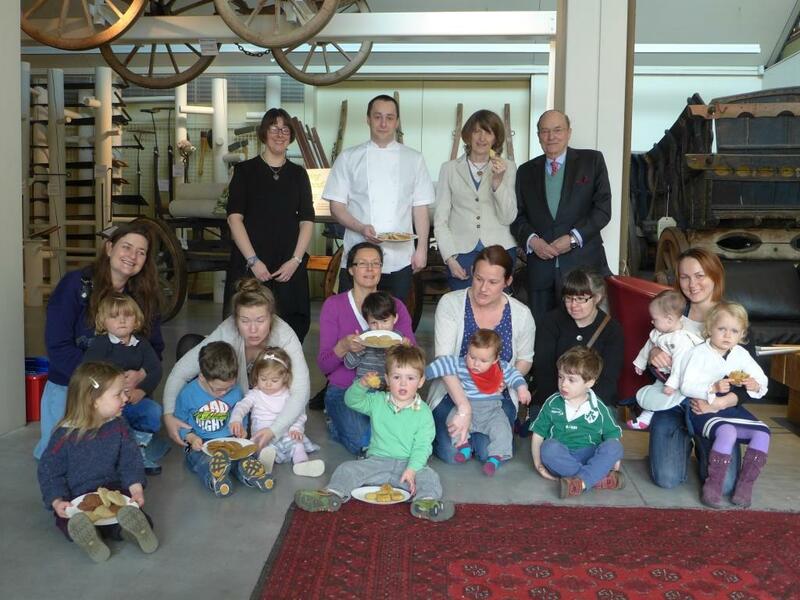 Last Friday, the Village Fete team hijacked the regular Friday Toddler Time session to launch the ‘MERL Biscuit Bake-off’ which will be judged at the Fete on May 31st. One of Reading’s famous 3Bs, biscuits are part of the town’s – and MERL’s – heritage. Our beautiful Victorian building is the former family home of the Palmer family of Huntley & Palmer’s, and we hold their archive in the University’s Special Collections. Introducing a ‘Biscuit Bake-off’ competition to the Fete seems the perfect way to encourage the people of Reading to get baking biscuits! 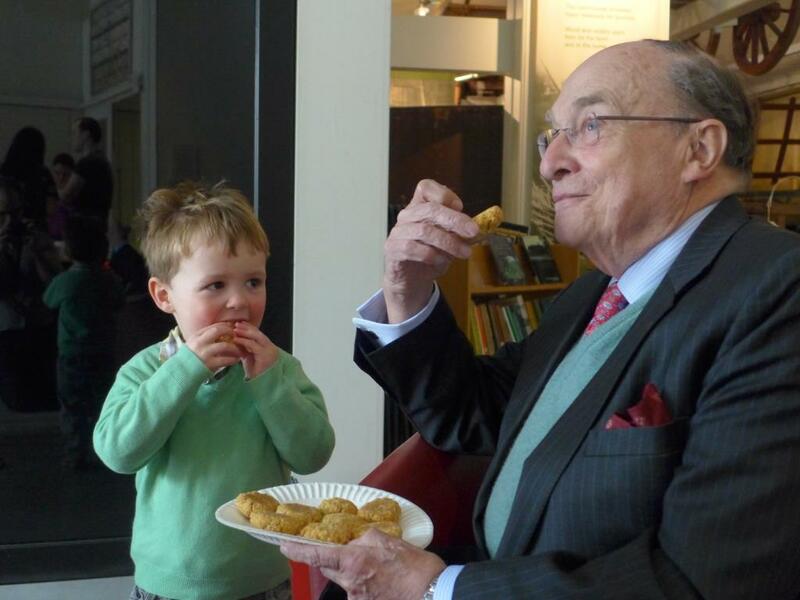 Regular Toddler Time attendees were invited to bring in their favourite homemade biscuits to be tasted by long-term MERL supporter and descendant of the Palmer family, Andrew Palmer and his wife Davina. Despite the chaos as families arrived armed with plates of biscuits, Andrew and Davina had a great time trying out everyone’s delicious offerings! 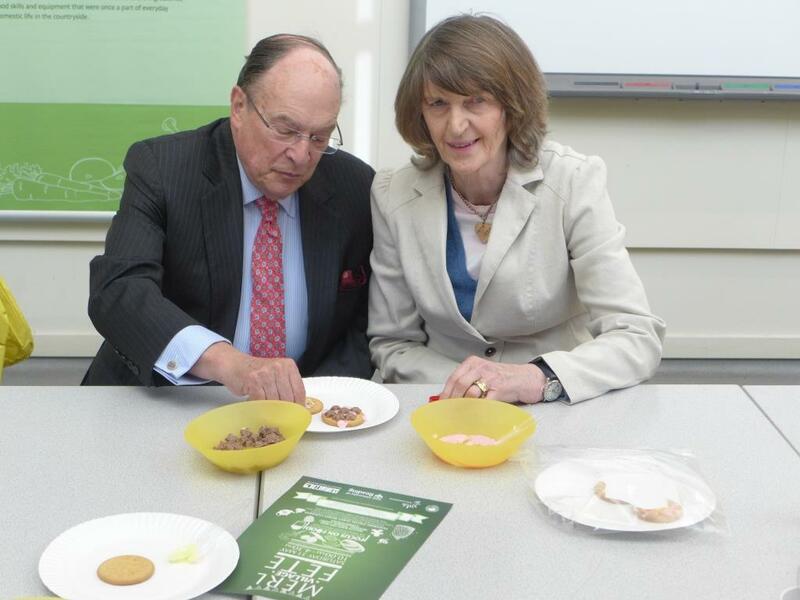 Everyone was also very interested to try the biscuits baked by Deiniol Pritchard, a Food Science student at the University. These were inspired by a recipe for ‘University Rusks’ from the records of ‘Huntley & Palmers’. 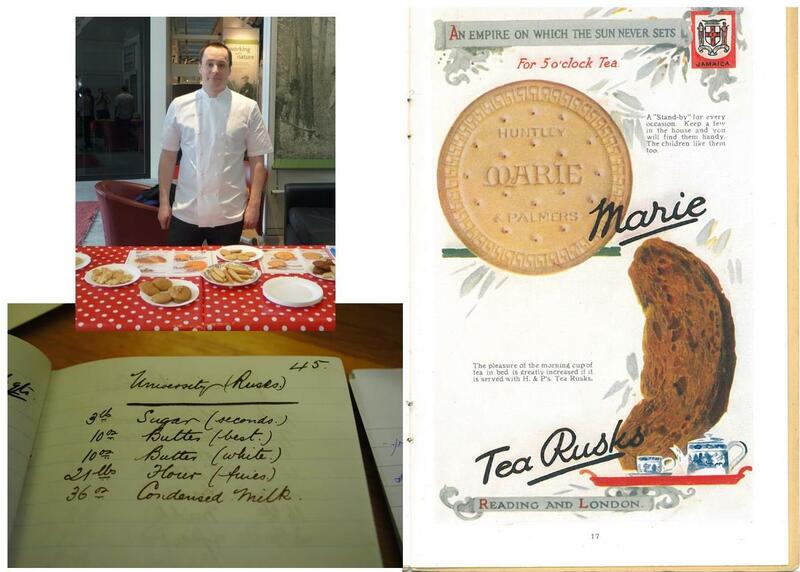 Deiniol with his biscuits, the Huntley & Palmer recipe for University Rusks and an image from the archive of Tea Rusks. After a photo session (look out for pictures in the local press!) and the usual sing-along on the carpet, the toddlers enjoyed the rest of the session decorating biscuits in the Studio, where they were joined not only by the Palmers, but also by the University’s Vice-Chancellor, Sir David Bell, who happened to be at the Museum for a meeting, and called in to investigate the commotion! Everyone is welcome to enter the ‘Biscuit Bake-off’ at the Fete. There will be ‘traditional’ and ‘freestyle’ categories, and several age groups – from Under 5s to adults! Just bring your favourite homemade biscuits to the event on the day. You can find details of how to enter on our website. In the meantime, we’re going to be posting a different biscuit recipe on the blog each week, so watch this space for inspiration and start practising!